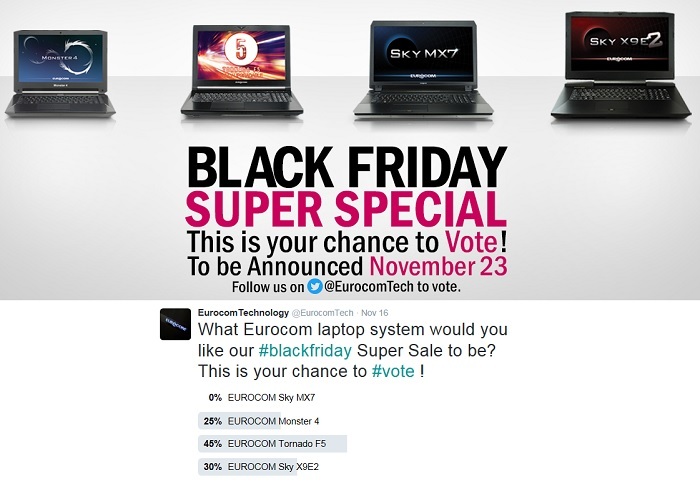 Eurocom launches a Twitter only Black Friday Super Special where fans can vote for the system they would like to be discounted on Black Friday. The choices are the EUROCOM Tornado F5, Sky X9E2, Monster 4 and Sky MX7 laptops. “Eurocom believes in offering customers complete choice in configuring their new Eurocom laptop where they can decide the components they desire to install in their new laptop during the ordering process. We have now extended that thinking by allowing our customers to democratically choose which system they would like to be discounted this Black Friday. At Eurocom our customers have total freedom.” Mark Biailc, Eurocom President. The winner of the vote and the discount will announced after the twitter poll has been finalized. The EUROCOM Sky X9E2 is directed towards individual Virtual Reality developers covering vertical markets from education, training, medical, engineering, entertainment, military and content creators providing them with fully portable VR solution for on-the-go development and testing. The Sky X9E2 is so powerful it can utilize two 330 watt AC adapters. The EUROCOM Monster 4 offers shocking performance, buttery smooth frame rates, long battery life and ultra-portability. A perfect fit for those who want to conquer today’s mobile world. Performance comes by way of NVIDIA GeForce GTX 970M graphics and optional Intel Core i7 processors up to i7-6700HQ, up to 32 GB DDR4 memory and up to 3 TB storage with one M.2 SSD and one 7 mm storage drive bay. Up to 32 GB DDR3-1866 SODIMM memory is supported via two slots with 16 GB modules that are easy to access to upgrade or replace. The NVIDIA GeForce GTX 970M GPU provides a potent combination of immersive features and performance that you deserve for all your games, applications, and entertainment; while also providing intelligent power features to extend battery life. The 17.3” Sky MX7 laptop is a potent combination of power in a thin and light system. The on-board, surface-mount design of the Intel Core i7 6700HQ CPU and NVIDIA GeForce GTX 980M GPU keeps this laptops’ weight down, and allows us to pack more performance and features into a slim form factor. The onboard components also minimize power consumption, which means less heat when you’re gaming on the go for a slim form factor, and a light weight! A whopping 64 GB DDR4 memory is supported via four SODIMM and is easily accessible and upgradeable. Four storage drives are supported for a maximum of 6 terabytes of solid state, RAIDable storage. A high performance, high quality copper thermal solution combined with high speed fans has been designed to keep the internal components within operating temperatures in such a thin chassis. •	Mechanical (Frame):brushed aluminium (back cover and bottom case) combined with heavy duty ABS plastic (front cover and top case). •	Cooling: High performance, high quality copper VGA and CPU heatsinks to keep your system running cool.